"I am rebuilding worn-out hillside lands that were worked out and destroyed by our wasteful California pioneer farmers. I believe the soil is our one indestructible asset, and by green manures, nitrogen-gathering cover crops, animal manure, rotation of crops, proper tillage and draining, I am getting results which the Chinese have demonstrated for forty centuries." In 1915 when Jack London was experimenting with groundbreaking methods of farming and progressive, more humane ways of dealing with farm livestock, he was far ahead of his time. 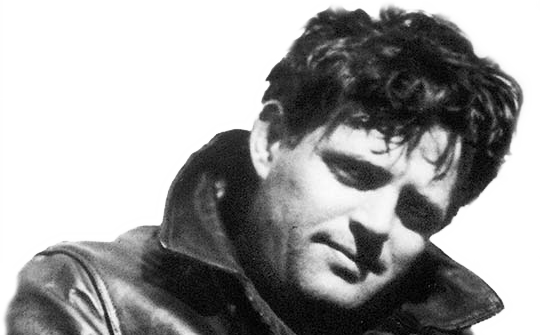 A 2014 article in Modern Farming, “Jack London’s Futuristic Farm,” sums it up: “Jack London has been called many things throughout history, among them, an author, explorer, visionary and a socialist. He has even been called the greatest romantic of his time. However, above all these fancy titles, he was a farmer—and an inventive one at that.” View rare footage, created a few days before he died, working with his farm animals at Beauty Ranch. 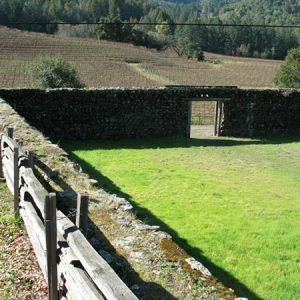 In 1905 London bought the first of several ranches on Sonoma Mountain in Glen Ellen. Using proceeds from his prolific writing career, London acquired adjoining parcels over several years and expanded his ranch, also known as the Ranch of Good Intentions. By 1913 London owned 1400 acres on the slopes of the mountain and by 1916 employed nearly fifty people. In 1905, while living with Charmian at Wake Robin Lodge in Glen Ellen, California, Jack decided to settle permanently in the Valley of the Moon. In June, he purchased his first real estate—the Hill Ranch—for $7,000. “130 acres of the most beautiful, primitive land to be found in California,” London said. He wanted to “leave the land better for my having been,” and so more than 100 years ago, he pioneered many of the principles which are the foundation of organic farming today. Today’s organic and biodynamic farming techniques owe a great deal to London’s innovation, including controlled animal grazing, use of green manures, crop rotation, recycling animal and plant waste via composting and natural fertilizers. Jack London was one of the first true organic farmers in the US. “Do you realize that I devote two hours a day to writing and ten to farming?” he wrote in his journal. Luther Burbank, the world’s leading horticulturist (and another Sonoma County resident) consulted with Jack on an experiment with growing spineless cactus as cattle feed. Unfortunately, the cactus needed irrigation for rapid growth, and some plants grew back their spines. A small demonstration patch of cactus remains in the meadow. 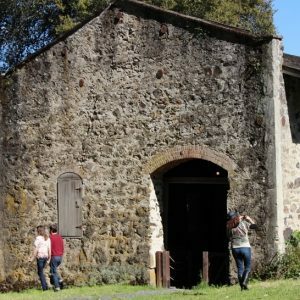 He built the first concrete block silo in California and filled it with silage from his and neighboring ranches. This green silage consisted of shredded corn stalks to feed his dairy cows, while the pigs got the corn. He hired Italian stonemasons to build a barn for his horses as well as a manure pit to develop composted fertilizer. He produced record yields of oat hay on acreage once considered overfarmed. He planted hay, 65,000 eucalyptus trees and went after more acreage, gobbling up struggling ranches nearby. The main Kohler and Frohling winery building was heavily damaged in the 1906 earthquake. Designed by London and built in 1915. Laid out in a circle to save labor. 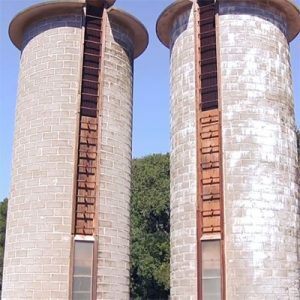 There are two cement block silos, erected between 1912 and 1915, standing over 40 feet tall. Today, the distillery holds an exhibit for horse-drawn farm equipment used in London's time.